An earthquake with a magnitude 7.2 rocks the islands of Bohol and Cebu. 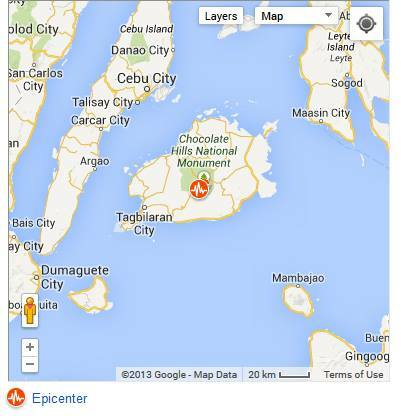 Epicenter is projected at Carmen Town in Bohol, where you can find the Chocolate Hills. The October 15,2013 earthquake shook the grown for close to a minute. Aftershocks and tremors are still being experience. All those in coastal areas are advise to watch out for warnings from local officials in case there will be a preemptive evacuation. UPDATE: Phivolcs has released the advisory that there is no expected tsunami and no warning will be released for this. The reason given was that this earthquake or linog happened on land, not on water. Strong aftershocks are still felt after an hour from the first earthquake. No Tsunami warning has been raised here in Cebu but we advice people to stay away from coastal areas just for precaution. Even century old churches were not spared by this natural disaster. The famous Sto Nino Cathedral in Cebu has damages in its bell tower while churches in Bohol like in Loboc and Baclayon suffered massive damages. Early reports say that 2 were killed in the public market in Mandaue City, Cebu due to a collapsed roof. Please SHARE to get others informed. Thanks.